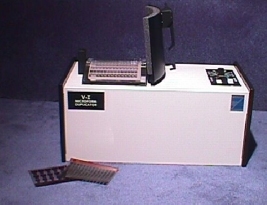 The V-I Microfilm Duplicator represents a leap forward in state-of-the-art technology in microfiche duplication techniques. It employs a tight registration pressure pad which anchors onto a spring-loaded glass to maintain total intimacy of contact between master and duplicating film. As a result both exhibit the same sharpness, resolution, and detail. The exposing area has a curved glass which, with collimated light rays from the U.V. source lamp, provides optimum resolution. After the operator selects a time sequence, a PRINT switch is actuated, the shutter opens and exposes the duplicate film to the desired amount of light for perfect exposure.